Setlist Helper is an app for musicians that need a reference to their song catalog. It is meant to replace the physical songbook. You can organize your songs into a setlist. Also, you can organize your lyrics by assigning Tags to songs such as Acoustic, Dance, Worship, etc… You can search for lyrics or add your own custom lyrics. The app should open with the “Home menu” open. To open the main menu tap the button with 3 lines. It will only appear if you are at one of the root level screens. Root level views are the first view that appears when you tap one of the menu items shown below. Songs – Shows you the list of all the songs in your repertoire. Setlist – Shows you a list of all the Setlists. Tags – Shows a list of all the tags. Tags are like categories. It is a way to organize your songs into a smaller set. 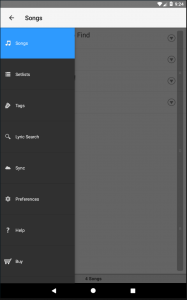 Lyric Search – Lyric search allows you to search most websites on the internet for your lyrics or lyrics with chords. Sync – Allows you to back up your data to www.setlisthelper.com. Preferences – Change the settings in the app such as Dark Theme, Show/Hide song attributes in the list. Help – Takes you the page you are looking at right now. You will want to start by adding your own lyrics. Below are several ways to do that. Working with the Bluetooth pedals in the app.